The result of the finished project will vary depending on the yarn used. 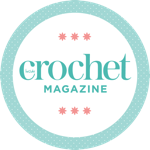 We always recommend swatching before beginning a new crochet project and using the yarn suggested for best results. However, if you decide to use an alternative, ensure you swatch thoroughly to achieve the correct tension provided in the pattern. All patterns are for personal use only, no pattern or part of this magazine may be reproduced and redistributed without prior consent from Tailormade Publishing Ltd.